I’m not sure if this is the right place to post this So mods can move this if they want. 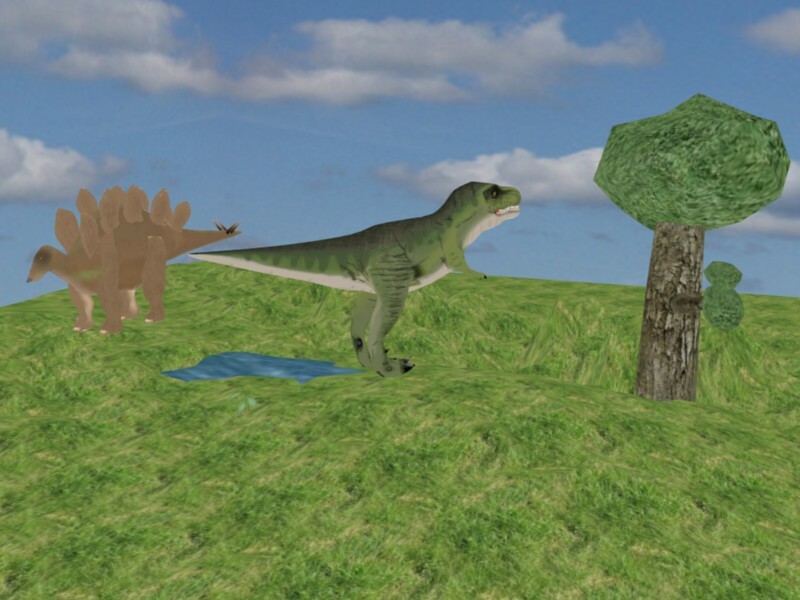 After getting help from Duoas (thanks a lot), I started getting background pictures to make a dinosaur screensaver I discovered that it looked awful so I decided to switch to 3d scenery which although it will take longer to open, will look a lot better. Anyway, the only dinosaur models I have low-poly enough to be of any use are my Stegosaurus and a T. Rex by Anderson Gutierrez. If anyone has low-poly dinosaurs, plants, environments or sound effects they would like to contribute, please do, your names will be included in the readme. Here’s the first update, a lakeside scene. I’m quite happy with the plants although I plan to include more types later. The textures are from www.cgtextures.com. Here’s an update. 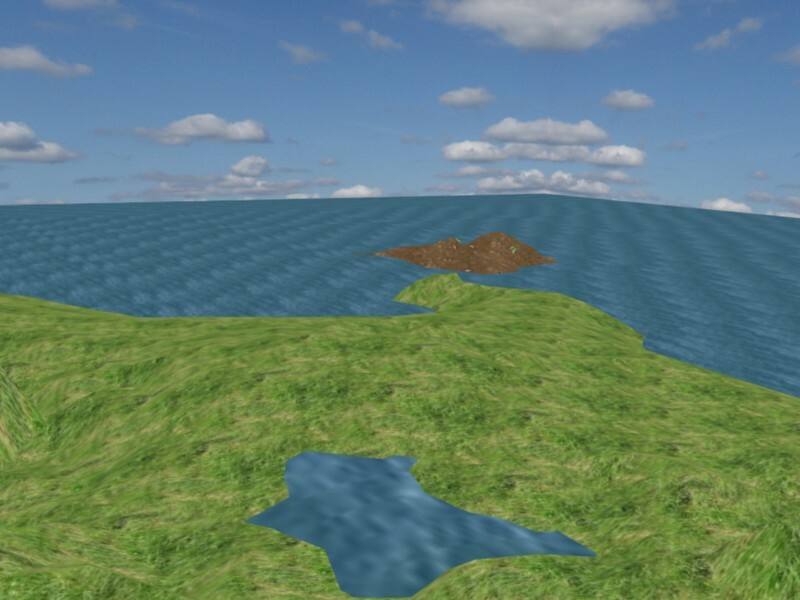 I decided that the lake scene was too small so I converted it into an island scene. If anyone has plants or dinosaurs you’d like to see here, let me know. the textures are very repetitive and there seems to be no bump mapping. How do you make it into a screensaver though??? watchthis: I know, it didn’t seem to be a problem when it was just a small area but as the ocean and island got bigger it became a problem. I’ll look for a bigger texture. There isn’t any bump mapping but I don’t think it can be used in the game engine. Turin Turambar: You copy certain dll files from the Blender folder to a new folder and then open the file you want made into a screensaver and click File -> Save runtime, save the file and change the .exe part to .scr. I’m having a few problems though, when I run it the dinosaurs keep jumping from side to side because they randomly change direction. I used the random controller but it changes direction too quickly. Here is an update on the environment. Since my first response about creating a screensaver from Blender, I’ve gone and done it myself, and discovered a few limitations I don’t like. Don’t worry if you don’t know what a starpack is… all will be explained. Thanks again, that will be useful. Will we be able to make the configuration window in Blender or will it be a picture with buttons? I hope no one will ever use the uninstall when I finish the screensaver. Er, programming the configuration window in Blender would be overkill, and overly complicated. The configuration window will be a simple Tk script that I’ll provide, which will edit a small flat-INI-format file (no sections, just keys), which your Blender Game can open and read when initializing. I can’t imagine your configuration options would be that complicated? Number of dinosaurs. Day or night? Can a T-Rex appear and eat other dinosaurs? Things like that. Duoas, find Genscher he did a patch improving blenders internal screensaver stuff ages ago… I don’t think it ever got into blender officially. Can a T-Rex appear and eat other dinosaurs? About that, does anyone with game engine experience know how to get the dinos to interact and move around without being controlled by the user? However, for configuration I always get a message dialogue proclaiming “This screen saver has no options that you can set.” I could of course be blissfully unaware of some way to hook options into the Blender Game, but that alone is not the reason for my geekiness. 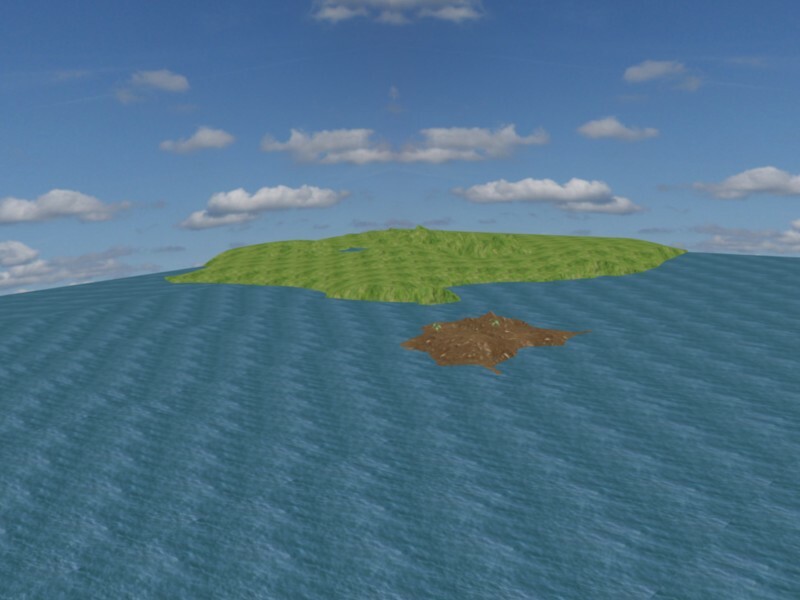 I aim to produce a single executable file distribution archive, which transparently installs the Game or ScreenSaver, registers an uninstall option with the Windows Add/Remove Programs Control Panel applet, and, since current versions of Blender require 10 megs worth of DLLs with every runtime, keeps them all together (no matter how many Blender games and screensavers installed) and out of the Windows directory (where they don’t belong). Oh yeah, you’ll need to do some python scripting to give your dinos “intelligence”. Know of any good tutorials? I’ve never done any Python programming before. How’s the progress on that starpack Duoas? Here’s an update, I started work on a second environment. Anyone got good side view reference pictures that can also be used as textures? Thanks. Sorry I haven’t responded here sooner. For Python, your best bet is to visit the game forum with questions there. Python isn’t hard, but dinking with the blender game blocks takes a little getting used to. I hope your health improves. If you finish it in a month it might be in time for my birthday. I’ve replaced the grass and sky textures which didn’t look very good. Now I need some more dinos, I finished the Utahraptor that I was working on and I’ll add it but you can’t have a scene without some herbivores. Know of any site where I can get low poly dinosaurs? p.s: You may recognize the texture, it’s from Walking With Dinosaurs, so I was wondering if it would be alright for me to upload the model. Edit by moderator: image links were removed because the uploader service at polorix.net was closed down and asked for a password on connection, which popped up a silly dialog. No comments? Crits? I need to see what I’m doing wrong before I do the rigging. Is it possible to do that in the game engine? I did it the way it is now because I thought it was the only way to tile images in the GE. yes, but you need to use a GLSL script. 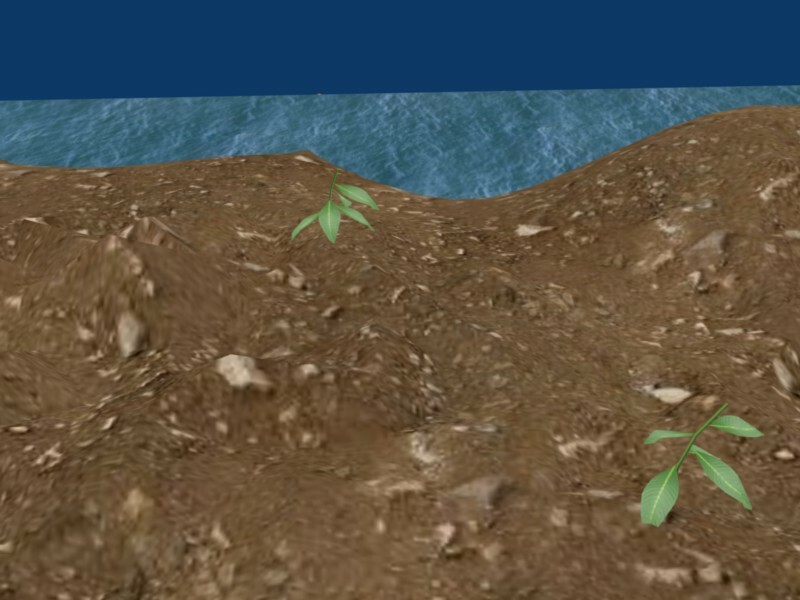 look in the blender game engine example files under bump maping.